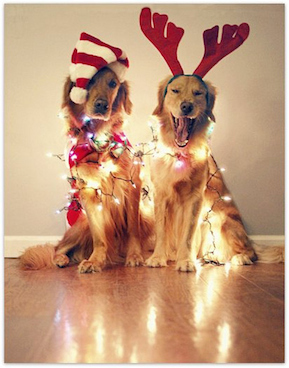 Once we have your photo, we will upload it to the Holiday Pet Photo Contest album. To find your pet’s photo, visit our Facebook page, click on Photos, and then click on Albums on the top right, and you will see the contest album. Once you find your photo in our Albums section, feel free to share, comment and like it, because the photo with the most “likes” on our Facebook page wins!! This contest starts NOW! And it will end on December 24th at 11am EST. Winners will be revealed by December 26th. 3 HOLIDAY PET PHOTO PRIZES!! 3 WINNERS!! ***Remember, the photo with most “likes” on our page wins so please email us your photo entry today and share the Holiday Pet Photo Fun! Thank you! a. You must be 18 or older to participate, and live within the Continental United States of America. b. By entering and participating in this contest, you agree to release Facebook. c. The contest is in is in no way sponsored, endorsed or administered by, or associated with, Facebook. d. In order for your photo to be considered, please “Like” our Facebook Fan Page, and submit your photos for the contest either by a Facebook message, or by emailing them to us at: contact@ridgewoodvet.com. Upon receiving the photos we will post them into a photo album specifically for the Holiday photo contest. Please make sure that you identify your pet’s first & last name when submitting the photos. You must be able to submit a regular sized digital (Jpeg) to Ridgewood Veterinary Hospital for this contest. Please include the entry photo’s title, your full name, pet’s name, email and contact phone number. e. You may only submit 1 picture of each pet; however, you may enter as many pets as you wish. You may also submit a group photo of your pets for consideration as well as individual pictures. f. If you win the contest you may be contacted via email so along with your entry, please include your full name, email and contact phone number. Your contact information will not be used for anything other than to contact you to inform you if you win this contest. g. By participating in the contest you are allowing us to use and distribute the image of your pet on any of our online websites, social media and related print/web marketing of Ridgewood Veterinary Hospital. Therefore, you must have complete and exclusive rights to the original photograph and be the pet owner. If the entry photo also has a picture of a person or group of people, you must be that person, or the parent and/or guardian of that person. h. By participating in the contest you understand that by posting photographs on Facebook (or any other internet website) your photographs may be available for public viewing and/or use. Ridgewood Veterinary Hospital is in no way responsible for any distribution of your photograph beyond our normal marketing by any other individuals or companies. i. Contest ends on December 24, 2014 at 11am EST. Winners will be notified by December 26, 2014.
k. There will be 3 winners in total. The first prize winner will win: $300 Ridgewood Veterinary Hospital Gift Certificate. The second prize winner will win: $150 Ridgewood Veterinary Hospital Gift Certificate. The third prize winner will win: $75 Ridgewood Veterinary Hospital Gift Certificate. l. Any questions? Please direct all queries to contact@ridgewoodvet.com.